perhapablog... and other ramblings: cosplay from detroit~! finally back and settled in a bit from our trip to detroit! big, BIG thanks to my pal, tony miello and gary reed for having us out there~! though the show was...quieter...than we'd hoped it would be, we had a great time in the motor city and had lots of fun hanging with friends and getting a chance to check out lots of cool new books by some cool new writers and artists--more on that on friday! got to spend a lot of time flying out with ron marz--my good pal and former volleyball teammate--and our date, the lovely and legendary, ramona fradon. got to spend a lot of time with ramona, actually, and was thrilled when she offered to do a cover for us for an upcoming perhapanauts! can't wait to see that!! craig and i got to hang a bit with jason and shannon howard, dave and julia petersen...and chris and xan sprouse popped up as guests for some hugs and some chats on sunday afternoon! our pal thom zahler was right across the aisle from us where we could throw things at him and paul storrie was hitting him from the other side. of course, i remembered my camera this time and there were quite a few people dressed to delight in detroit. and apparently, this photo showed up last week, taken some 120 years ago, of a man that looks startlingly like nick cage. 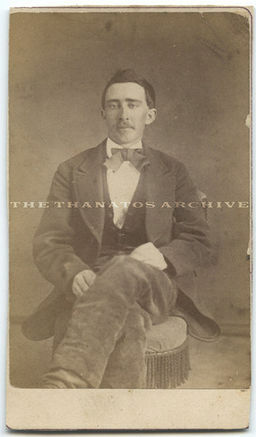 many, including cage himself, have concluded that this photo is proof that nicolas cage is actually a vampire. i have, for the past week, been listening to the new book by ernest cline, ready player one, and suggest you run out and get it or download it or whatever and do the same. it's nerd-vana!! Sorry to hear the show wasn't busier, but sounds like you guys had a great time. Nice Rocketeer and Phoenix. And the Muppets made me laff-out-loud. Glad you had fun. You deserve it. That can't be a vampire -- he's not sparkly. But actually, Nick Cage is an immortal wizard, known in various eras as Vimbinky, Doitcauzyilikus, and as he was known in that photo, the Great Nozzo Goode. And I loved the Muppets. That is just awesom! Best convention costumes ever!